Preheat oven to 300 degrees. 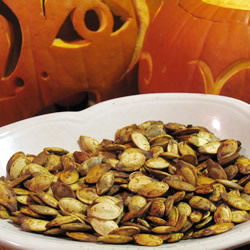 Toss pumpkin seeds in a bowl with melted butter and salt. Spread the seeds in a single layer on a baking sheet and bake for 45 minutes or until golden brown. Stirring ocassionally.